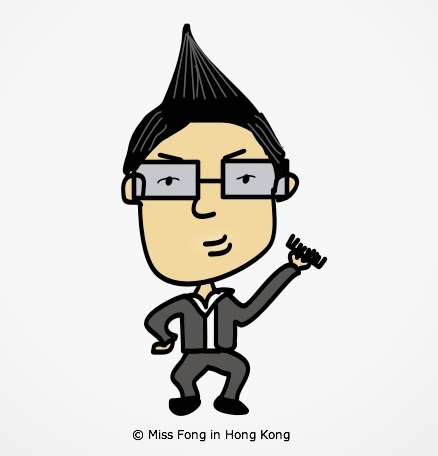 So you may have already heard about (or seen) this impossibly pointy haired man shaping his hairstyle in the MTR, and the way he did so with the exaggerated movements seemed so ridiculous that I was pretty sure he wasn’t real (ie. that it was a prank of some sort). But lo and behold, while I was in the 24-hour Wellcome’s cookie aisle last night, I saw Mr. Pointy Hair himself next to me checking out the cracker options. I couldn’t help but get excited at the sight of him and the pyramid of hair that sat on top of his head. Stiff and full of gel or hairspray, or both. He seemed to notice the stares (as he kept looking at me), probably because I kept glancing at him too. And something told me that he must know that he’s become somewhat of an internet sensation, because he seemed to welcome the attention as he walked through the aisles. The way he combed his hair is so epic! Lol! lol i had the honour of seeing him in central man yee shopping mall not so long ago too! he's hilarious!